Apple Watch Not Vibrating? Here's Why & The Fix! You are at:Home»Apple Watch»Apple Watch Not Vibrating? Here’s Why & The Fix! Apple Watch Not Vibrating? Here’s Why & The Fix! Your Apple Watch doesn’t vibrate and you’re not sure why. You’re missing important messages and notifications and it’s starting to get frustrating. In this article, I’ll explain why your Apple Watch is not vibrating and show you how to fix the problem for good! Sometimes your Apple Watch doesn’t vibrate because of a minor technical glitch. 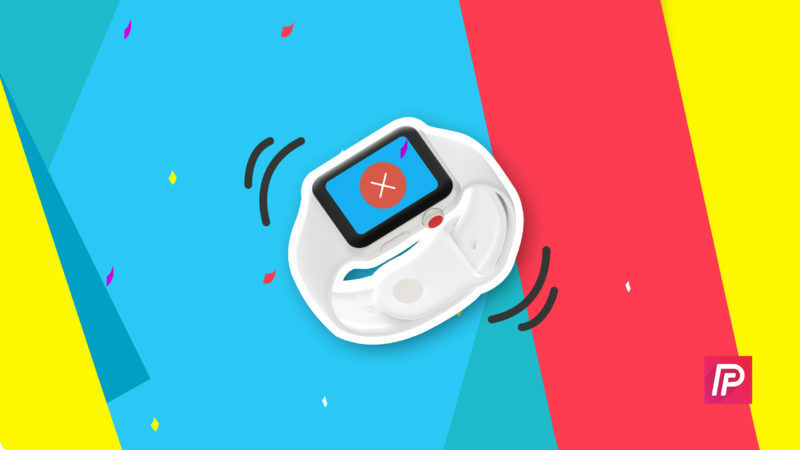 We can attempt to fix minor software problems by turning your Apple Watch off and back on. 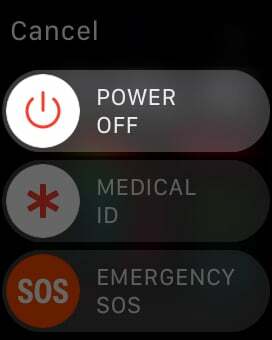 To turn your Apple Watch off, press and hold the Side button until you see the Power Off slider appear on the display. Swipe the power icon from left to right to turn off your Apple Watch. To turn your Apple Watch back on, press and hold the Side button until the Apple logo appears on the center of the display. Now you can test to see if your Apple Watch is vibrating again by pressing and holding the the watch face. If your Apple Watch doesn’t vibrate when you force touch the display, move onto the next step. If your Apple Watch is not vibrating, the Haptic Strength slider may be turned down all the way. 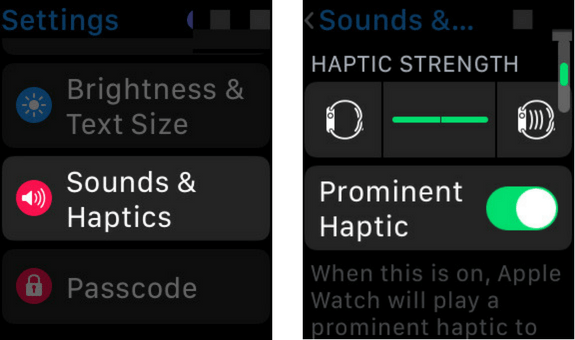 Go into the Settings app on your Apple Watch and tap Sounds & Haptics. Next, scroll down to Haptic Strength and turn the slider all the way up. To turn the slider up, tap the Apple Watch haptic icon on the right side of the slider. You’ll know the slider is turned all the way up when it is completely green. 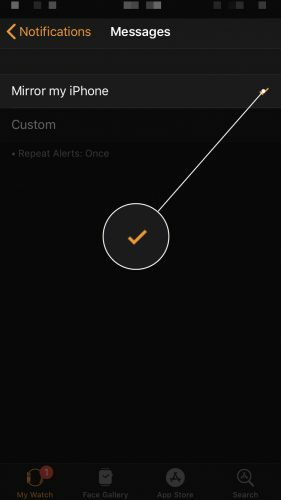 If you have custom Notifications settings on your Apple Watch, you may have accidentally turned off Haptic when certain apps send you an alert. If Haptic is turned off for specific apps, your Apple Watch won’t vibrate when those apps send you notifications and other alerts. Go to the Watch app on your iPhone and tap Notifications. One-by-one, tap on your apps in this menu and make sure the switch next to Haptic is turned on. You’ll know the switch is turned on when it’s green! 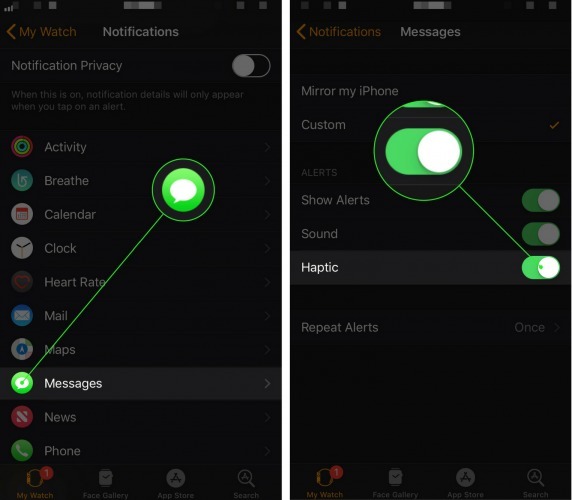 If vibration works perfectly fine on your iPhone, you can also choose to mirror the Notifications settings from your iPhone to your Apple Watch. If your Apple Watch still does not vibrate, there may be a deeper software issue causing the problem. 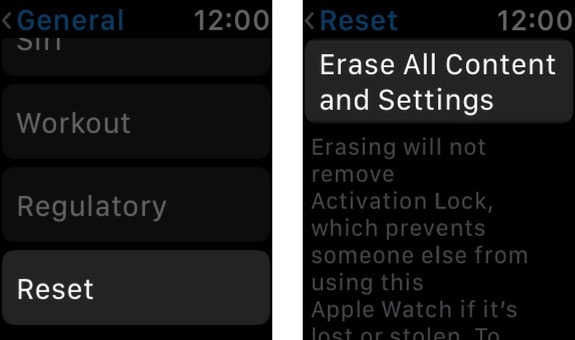 We can troubleshoot a deep software problem by erasing the content and settings your Apple Watch, which will restore all of its settings to factory defaults and completely erase all of its content (your photos, music, etc.). Open up the Settings app and tap General -> Reset -> Erase All Content and Settings. You’ll be prompted to enter your passcode and confirm the reset. Your Apple Watch will erase all of its content and settings, then restart. After reseting your Apple Watch, it’ll be like you’ve taken it out of the box for the first time, so you’ll have to pair it to your iPhone again. You’ll also have reconfigure your favorite settings, add your music back onto your Apple Watch, and pair your Bluetooth devices once again. If you’ve reset your Apple Watch’s content and settings, but it still isn’t vibrating, there might be a hardware problem with its Taptic Engine, the component responsible for making your Apple Watch vibrate. Schedule an appointment to bring your Apple Watch into your local Apple Store and have an Apple Genius or technician take a look at it. Your Apple Watch is vibrating again! Now that you know what to do when your Apple Watch is not vibrating, make sure to pass the information along though social media! If you have any other questions about your Apple Watch, feel free to leave them in the comments section below. Previous ArticleMy Apple Watch Froze! Here’s The Real Fix. Next Article Why Does My Apple Watch Battery Die So Fast? Here’s The Fix!